When we planned our trip to America, I never actually thought about going clothes shopping. I knew there were lots of bags and accessories that I wanted and I knew I was bound to buy some beauty bits but I didn’t really think about fashion as I love the stores that we have in the UK and I haven’t really lusted after any American brands. However when we went to the Florida Mall, some shops that advertised plus sizes in their window really caught my eye. One of those was Wet Seal. I’m not sure whether or not the plus size line at wet seal is a relatively new thing but it seemed as though there was a real buzz about it in store, with girls who didn’t fit into the pieces asking if the same style was available in the standard line. This was great to hear. What I found was that Wet Seal+ had some gorgeous, very light weight, casual tops that are perfect for the summer time and for holidays. I couldn’t get over how soft and thin they were but how great quality they were as well. I’m going on holiday again later in the year and I am really looking for some tops that I can wear during the day with shorts and the ones I found at Wet Seal+ are just perfect. 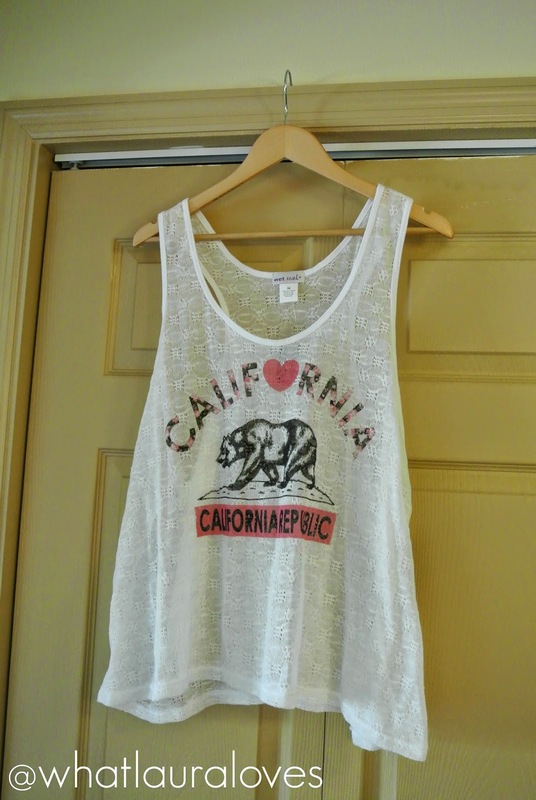 The first top that I was instantly drawn to is the California Flag Crochet Tank Top which was $19.90 here. It is white in colour so perfect for showing off a summer tan and it has a racer back and quite a deep scoop neck which makes it look great if you’re wearing a push up bra or a bikini. The top is super soft and is made of a sheer boho style crochet which is what makes me this it will be perfect for going to the beach in. The logo that is on the front is actually a pink and black version of the California flag, cute. I don’t find that tops like this are available in plus size in the UK so I’m pleased to have found one in America. The same goes for the Neon Crochet Back Tank which was again $19.90 here. This top is very summery thanks to its orange colour and the floral crochet at the back. Again, this one would be perfect for the beach thanks to its lose fit and slub knit body and great for wearing over a bikini top as it has a scoop neckline. One top that I have been wearing non stop since I got home is the Daisy Tank which was $16.90 here. 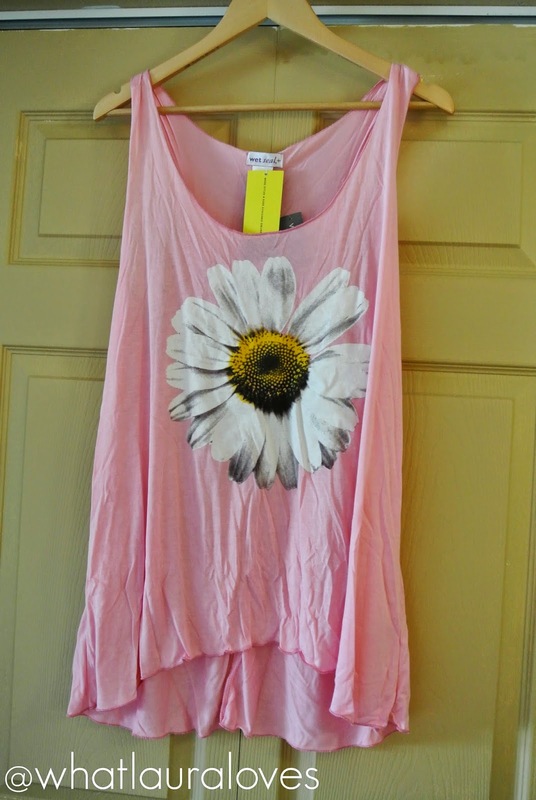 This is a super sweet pink vest top with a large daisy printed onto the front of it. It looks fabulous tucked into a maxi skirt and pulled out a little with a jean jacket over the top. I love the lightweight feeling that this top has- it literally folds up so super small so it is going to be perfect for taking on holiday with me when I go away. I like the shape of the top too as it has a scoop neck, a finished trim and a shark bite hem which means that the bottom of the top is a little jagged in shape and uneven. This top comes up a little further at the front than it does at the back. 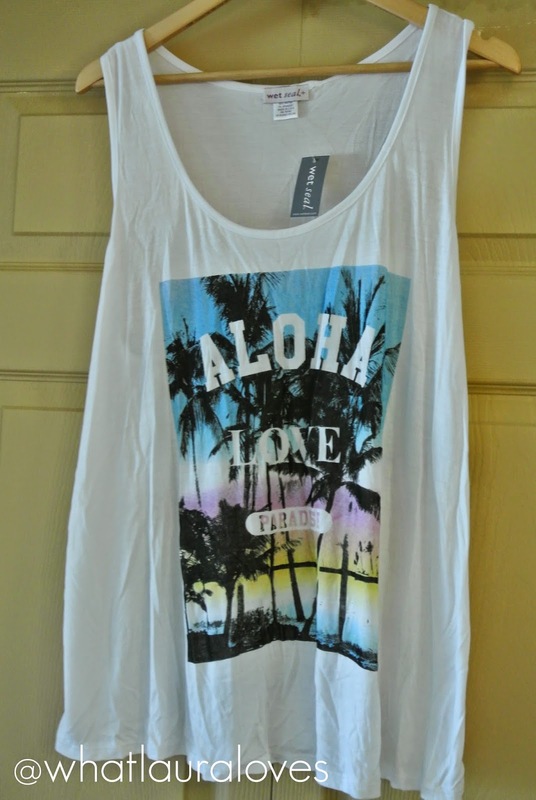 Another top that is great for tucking into skirts is the Aloha Tank Top which was $18.90 here. This is a typical summer top that Primark tend to sell a lot of in the UK. It has a round neckline and is super soft and comfortable to wear thanks to the stretch in the fabric. I love the tropical sunset print and the ‘Aloha Love Paradise’ slogan. 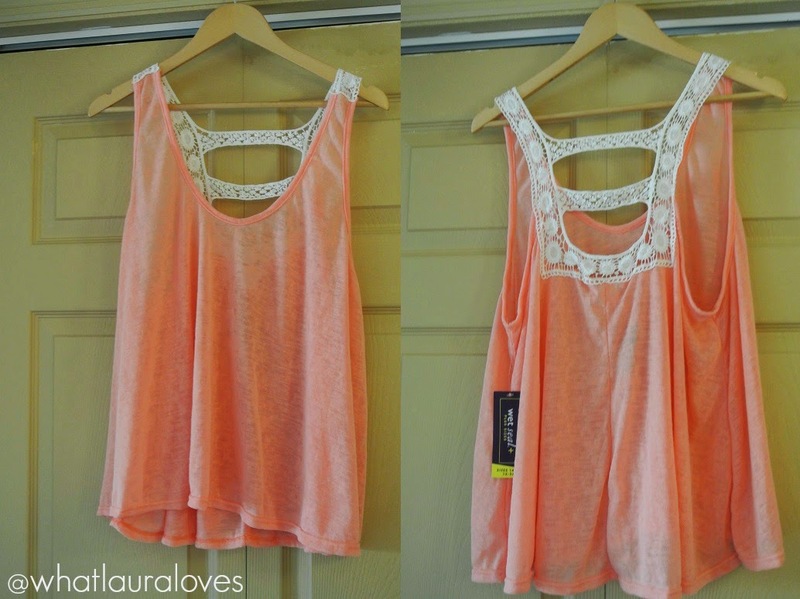 The next top that I bought was the Crotchet Neckline Flower Tank which was $22.90 here. I loved this top in store as it was paired with a sleeveless denim jacket and linen trousers which looked great together as a casual summer outfit. This top is a light blue colour with a floral brint all over it. There is a gorgeous which crochet detail around the neckline too. This top is still lightweight but it feels much more substantial than the others which is probably because the material feels thicker and it is lined at the front. 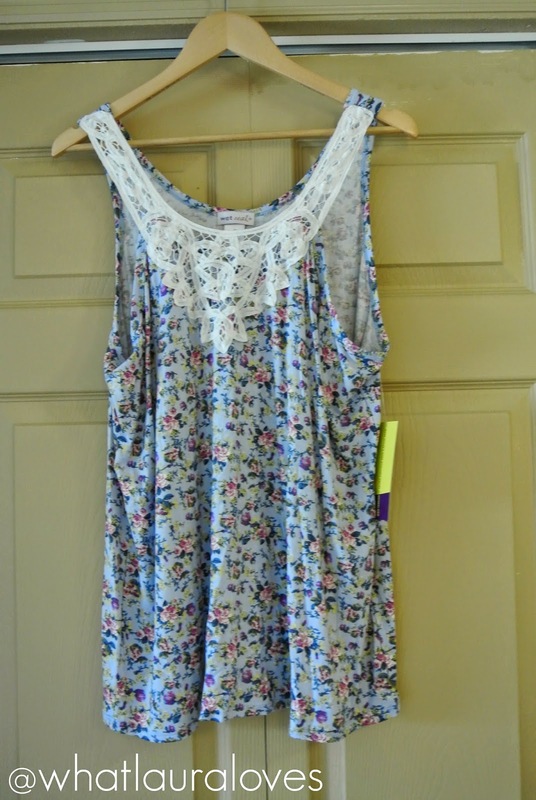 The final top that I bought was the Floral Tropic Tank Top which was $19.90 here. This is another super thin and light top with write straps and a round neckline. 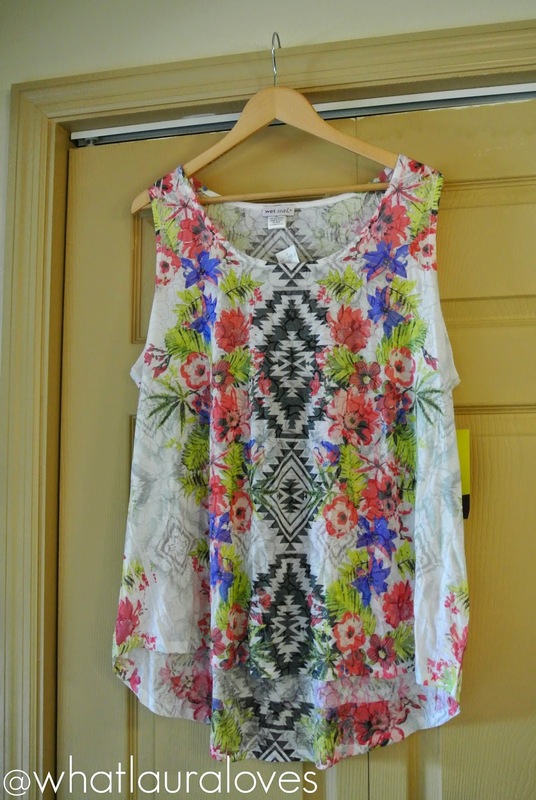 It has a high low hem which is great because it is long enough at the back to cover my bottom if I’m wearing leggings and I love the tropical flower and aztec print on it. I love tribal inspired pieces but I find that they’re often not girlie enough for my wardrobe whereas this one is. I love it! 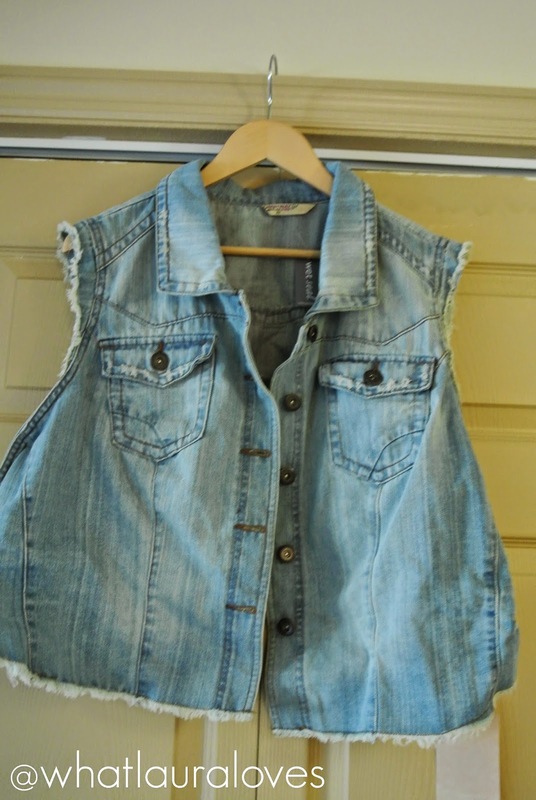 The final item that I picked up from Wet Seal was the Frayed High-Low Hem Denim Vest which was $26.90 here. I have a cropped denim jacket already but it has sleeves and I much prefer the sleeveless versions on super hot days or when I’m travelling abroad. This one is frayed along its edges and I love the casual, distressed look that this creates. It is longer at the front than it is at the back which I actually really like as I fit that I need things to be a little longer there to accommodate my shape. The sleeveless jacket is a light, washed denim colour which is great for the summer because it’ll go with lots of my summer tops like the ones I’ve bought here and my dresses. It buttons down with metal buttons although I’ll probably always wear it open and it has a flap pocket on either side of the chest which look cute, although I doubt I’ll actually use them to put anything in! So that’s it for my Wet Seal haul. I cannot wait to wear the pieces and show you them in a WhatLauraWore outfit post. I really wish we had Wet Seal in the UK as their prices were so great and when I got to the till they actually had loads of discounts on. I found that American shops were great for that and offered much more discounts than our shops do in the UK. Wet Seal even gave me a discount loyalty card so if I go back in the future I can get more discounts on the clothes. Have you shopped in Wet Seal Before? What are your favourite pieces?